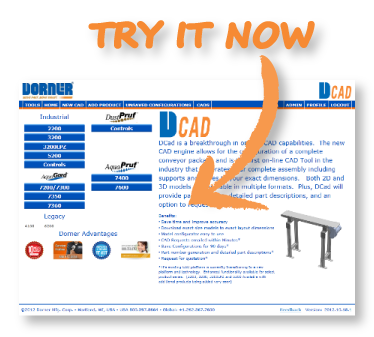 Dorner Manufacturing’s new CAD Configurator, “DCAD“, is an intuitive 2D and 3D CAD platform that allows users to build complete conveyor assemblies to their exact layout dimensions. The CAD tool is an industry first, providing the download of a single CAD model of the complete assembled conveyor, dramatically saving the time spent matching up individual files. Your CAD output is available in a variety of CAD formats and interactive 3D PDF. The DCAD models are pre-engineered and uses conveyor logic to only place applicable matching conveyor components together; if a system can?t be designed and built for actual use, the Configurator will not design it. This intuitive feature saves you time by alerting you of an erroneous design, allowing you to make the necessary adjustments before proceeding. When the design is complete, you’ll receive part numbers and detailed descriptions of all the components in the build, information to receive a quote, along with the CAD and 3D PDF files.